Railroad crossings are interesting places to model because things happen there – flashing lights go on and off, bells are going off, lighted gates come down and trains go by, all of which can be realistically simulated on your layout. If you have unlighted crossbucks with lamp housings, you could add either LEDs or incandescent bulbs by drilling into the back of the lamp housing without disturbing the plastic lens on the front, insert the LEDs and glue them in place. Then solder the anode wires together, and then solder a common wire to that connection. Take that common wire and run it down the back of the crossbucks pole along with wires connected to each of the 2 cathodes from the LEDs and glue the 3 wires to the back of the pole. Connect a 100-200ohm resistor to each of the cathode wires or a 200-400 ohm resistor to the one anode wire. Then connect the 3 wires to an alternating flasher circuit board like the ones made by Dallee, Miniatronics, GRS or Ram Track. If you use incandescent lights, you don’t have to use resistors as long as the voltage rating for the lights match that of your power supply. Also, you don’t have to worry about polarity as you do with the LEDs. It’s easier just to buy the crossbucks that already have working lights, and then connect the wires to the alternating flasher circuit board. In either case, the circuit board can then be activated by one of the sensor units (photocell, infrared or magnetic reed switch) described in the page on train signals. When the sensor picks up the presence of a train approaching the railroad crossing, it activates the circuit board, which then causes the lights on the crossbuck to flash in an alternating manner. Using the Logic Rail Grade Crossing Pro circuit board along with the 2 lighted crossbucks with crossing gates and bells available from Logic Rail (http://www.logicrailtech.com/index.htm) is probably one of the best ways to create a railroad crossing system for your layout. In addition to the circuit board, 2 crossbucks with gates and bells, you will also need to purchase a speaker, a compatible sound module, 4 photocells or other sensor devices (Infrared or Reed switches), all available at the Logic Rail website, and 2 Tortoise slow motion motors from Circuitron (http://circuitron.com/). 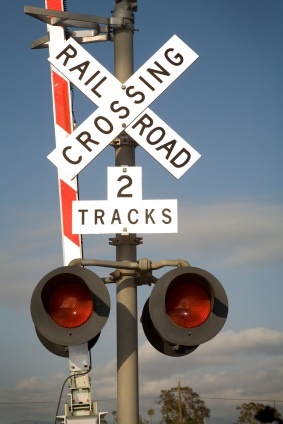 The Logic Rail website contains complete and very detailed instructions on how to set up your railroad crossing system, so it’s not really necessary to go through them all here since the instructions are free and easily accessible in the documents section of their website. You may also wish to look at the Azatrax website, which also contains detailed and clear instructions on crossing gate controller installation and includes modules for crossing bell sound effects. Basically, how it works is that you have 2 photosensors lined up in your track bed on each side of the road where your railroad crossing gates will be set up. When the train approaches the 1st photocell, the signals begin flashing and the bells sound off. 2 seconds later the gates will automatically start coming down (controlled by the Tortoise motors). If the train does not reach the 2nd photocell within 35 sec of covering the 1st photocell, it is assumed that the train has stopped or reversed, and the signals stop and the gates go up. If the train continues and crosses the 2nd photocell, the lights continue to flash and the gates stay down. After the train passes the crossing, and 3 seconds after the 4th photocell is uncovered, the lights stop flashing, the bells stop and the gates go up. If you’ve got this going on at the crossings and signals changing as your train makes its way around the layout, you already have quite a bit of action going on. If you add more sound effects and lighting effects and have one or more animated scenes, within the environment of a well-landscaped terrain and well thought out track plan and theme, you’ve got a very interesting layout! From "Railroad Crossings" back to "Homepage"